Another new Wallgazer design waiting to drop, entitled "Disintegration." Disintegration re-imagines the traditional static wallpaper pattern. To the right of the design, the wallpaper repeat holds tightly, a stair step pattern that is petal inspired. However, the pattern is deconstructed as it makes it's way to the left. 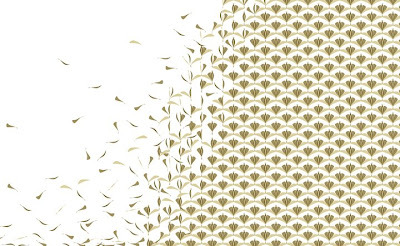 The petals appear to be blowing away in a strong wind, turning the wallpaper's focus from pattern repetition to a study of void and white space. The wallpaper, shown in it's original color scheme, can be customized. Like most of our custom wallpaper, Disintegration can be altered to match your color and decor seamlessly. The hue can be shifted in full, or we can adjust specific colors individually, all according to you. Disintegration will be available soon from http://www.wallgazer.net, in the meantime, there are over 50 wallpaper designs currently available. Even more wallpaper designs will be added to Wallgazer shortly, so check back frequently.